Good to Know: Maybe Patrick Stella should ask the professor for extra credit? The governor pounded his company’s handling of the crisis. The press wrote stories daily about families with young kids stranded in the dark. Customers complained that after a whole week no one had shown up to restore power. And, a nor’easter was expected to roll in. “There is a lot of stress,” understated Patrick Stella, the Albany spokesman for NationalGrid, who cannot be blamed for missing classes lately at The College of Saint Rose, where he is studying for his master’s in communications. Once it was clear that Hurricane Sandy had gone easy on his own region, Stella was assigned to assist restoration efforts of the Long Island Power Authority. It is safe to say that once he is back in his Saint Rose history of journalism class, he will have plenty to contribute on the topic of crisis communication. Reached by phone in Nassau County, Stella described trees crisscrossing streets, scores of utility workers dispatched from as far away as California, customers complaining they still don’t see a single one and reporters looking for explanations. Even so, he has found a way to make the electric company at least look human, arranging to have reporters interview the workers from close to home and across the country pulling 16-hour shifts to restore Long Island’s power. Stella has found that the line workers like to discuss the job — something people aren’t normally interested in. One crew works exclusively with the trees; the other repairs electrical lines. Some specialize in storm remediation. Customers are usually grateful – offering workers bottled water or coffee, if they are able to heat up the water. Occasionally, they are less than grateful and lob insults in person or via social media. Elsewhere, disgruntled customers have even thrown things at the workers, something Stella has not witnessed here. Stella doubts people will exactly enjoy paying their bills after watching an interview with a person who repairs downed wires. But he hopes to at least temper some customer’s frayed nerves with assurances that they are not being ignored. The climate is tense and it’s important to be careful. For instance, Stella had considered calling the Albany media to do a story on National Grid workers from the Capital Region working downstate. Then, he reconsidered. And so the question becomes, why does a professional so skillfully working communications for one of the country’s biggest news stories (there is also a presidential election) wish to earn a master’s degree in the field? Stella, who is 43, said he had been so busy doing the job that he had not had time to complete his education. A Binghamton native, he earned his undergraduate degree from the State University of New York at Brockport before working in communications in various parts of the state in healthcare, higher education and now energy. 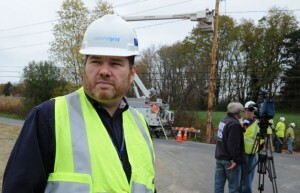 He has been the Capital Region lead media representative for National Grid since 2008. He said he had been able to apply lessons from the classroom to the front lines. Among the more useful classes was one in group dynamics. ← 2012 Election: Phi Alpha Theta Edition!